As the field of Human Resource Development continues to grow and impact the personnel and management of organizations, changes have occurred in the way that such people contribute and participate in citizenship behavior. 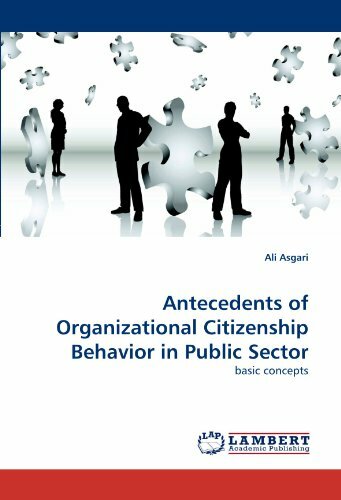 The Antecedents of Organizational Citizenship Behavior of Managers in Public Sector is a must-read for all managers and human resource professionals. Asgari describe a clear road mad, offer a comprehensive model, pragmatic tools and wise advice for all those concerned about improving human performance. This book has been designed to help many organizations and countless senior executives hone their leadership skills. This book is a must-read for any leader interested in developing a high performance culture by developing their people. This book described Organizational Citizenship Behavior in non-American context, especially in Asia.